Categories: Aqua / Turquoise, Blue, Gold. 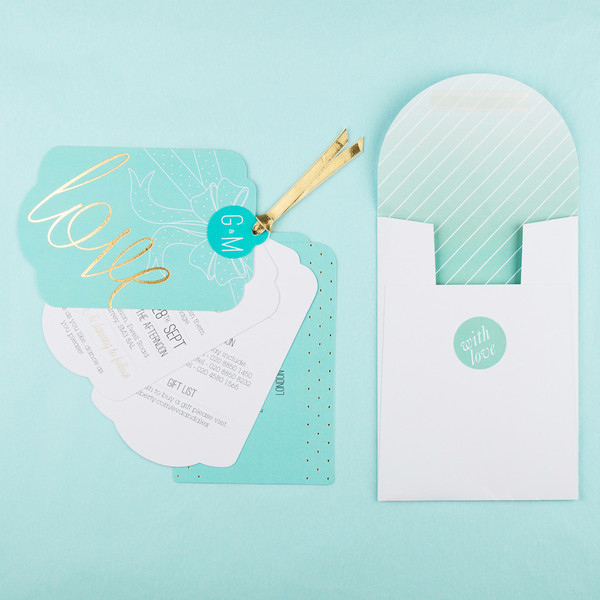 What’s the first thing you thought of when you saw the Holly Golightly Luxe invitation? We first thought ‘Wow!’, and then, inspired by the beautiful Hepburn blue colour and gold accents, our imaginations took a trip to a beautiful beach wedding complete with golden sand, warm sunshine and glistening blue sea. When we took a closer look at the details we realised that this was a very clever and versatile little 14.5cm x 9cm invitation indeed! The understated little bow illustration along with the shimmery gold ribbon could also fit perfectly into a Yuletide wedding! With a bit of imagination and creativity this invitation could complement an array of wedding themes. Making use of a handwritten typeface, the word ‘Love’ creates a glamorous and feminine presence which is evident throughout the entire invitation. The tag-style layout means that you will have the day/evening page alongside an information page and a perforated RSVP page (you can choose between 2 or 3 pages), ideal for those of you who like to keep everything organised and in one place. When your guests receive their eagerly-awaited invites in the post they’ll be greeted with a stylish envelope sealed with a cute ‘With Love’ sticker, whilst inside they’ll take note of a personalised monogram, attached to the very top of the bundle for that extra special touch. One thing is for sure, size isn’t everything, because what the Holly Golightly Luxe lacks in size it more than makes up for in style and chic appeal by Eagle Eyed Bride! Tags: Audrey Hepburn, Luggage Tags, Tiffany Blue.